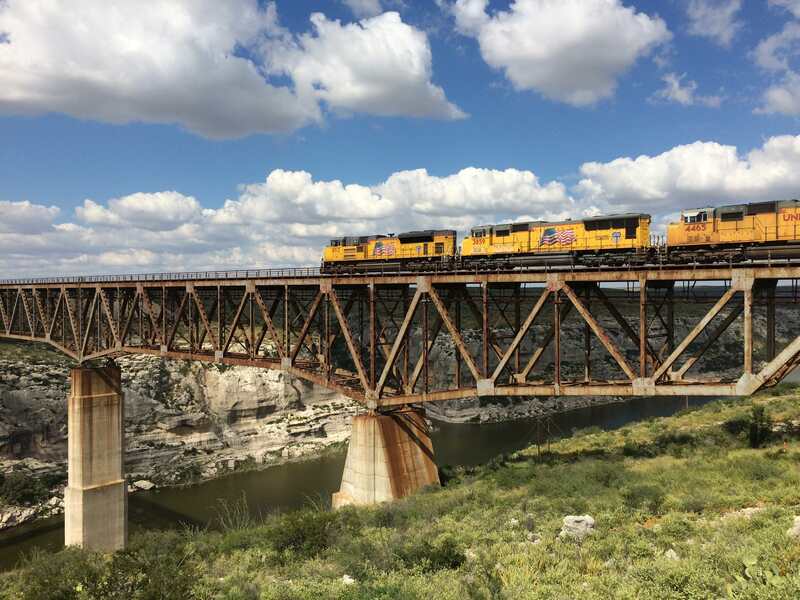 A Union Pacific locomotive crosses the Pecos River Bridge in Langtry, Texas. Credit: Union Pacific. The majority of Union Pacific’s (UP) 18,000 bridges are inspected by trained professionals at least twice a year. According to the American Society of Civil Engineers, 40 per cent of bridges in the USA are 50 years old or more and in-person inspections monitor the health of these vital structures across the country’s railway network. Helping to improve monitoring in-between inspections, UP is looking to introduce the widespread use of smart monitoring, a process that has the potential to revolutionise how the nation’s 614,000 bridges are inspected. “We want to know about potential problems between regular inspections, and if there’s a way to detect issues we want to take advantage of that,” says UP’s director of bridge maintenance Todd Martindale. Currently the train operator is working in partnership with the University of Nebraska, the University of Michigan and SENSR Monitoring Technologies on bridge monitoring projects. At the University of Nebraska, postgraduate students are using sensors to collect data from steel bridge members, using a century-old UP bridge in Columbus, Nebraska, as a guinea pig. The team installed sensors on specific bridge components and after testing created an analytical bridge model. This serves as the baseline, allowing them to revisit the site and continue collecting data. Any change in behaviour could signify a potential defect. The University of Michigan is working on a similar project, partially funded by a U.S. Department of Transportation grant. Students set up strain gauges on two UP bridges near Memphis, Tennessee. The devices send data back to the university where researchers collect and analyse it. They’re focused on how loads, such as the weight of a train or wind, impact bridge components and cause fatigue. In addition, researchers are incorporating train network influences, such as traffic volume, car weight and alternative routes, as well as bridge analysis data into a newly designed decision-making tool bridge owners can use to manage bridges. Finally, the partnership with SENSR is already showing results. The company has created a device that wirelessly processes and transmits data, and sends an alert if the structure shows an abnormality. The technology is operational on seven key UP bridges, with installation underway at another three. Earlier this year, a barge hit the Thebes Bridge spanning the Mississippi River in Southern Illinois. UP emergency personnel and the bridge team received an alert within minutes. Currently 95 per cent of UP’s bridges are inspected a minimum of twice a year by a specially trained two-person bridge inspection team, exceeding federal requirements. Bridges fewer than 10 years old and without defects are inspected once annually. If the technology is successfully developed, easily deployable and cost-effective solutions could supplement in-person inspections to boost safety across not only UP’s network but bridges across the USA.